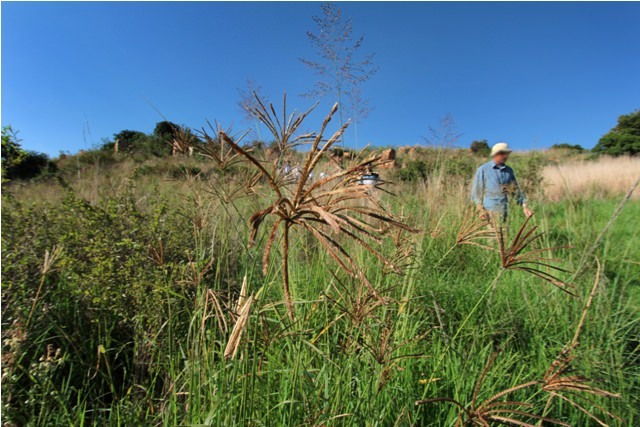 I’ve mentioned the Melville Koppies, a nature reserve and National Heritage Site behind our house, in previous posts. But until now I haven’t had the chance to give this natural wonder the attention it deserves. 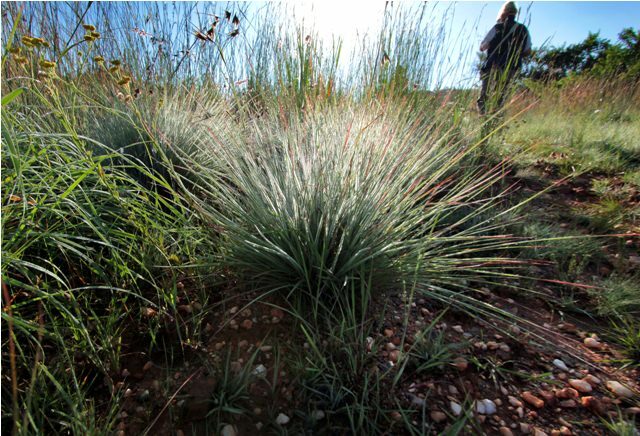 A spiky, grassy plant on Koppies Central shows off the morning dew. The Melville Koppies are nothing like Central Park, Hyde Park, or any other city park. They feel primordial and alien. Walking there is like traveling back in time — before Joburg traffic, before the gold mines, even before humanity. In addition to hundreds of indigenous plants and animals, there are rocks more than three billion years old and Iron- and Stone-Age ruins. But looming in your peripheral vision are reminders of the modern world — heavy power lines, houses, and the Joburg skyline. A photo of Koppies East from last August. 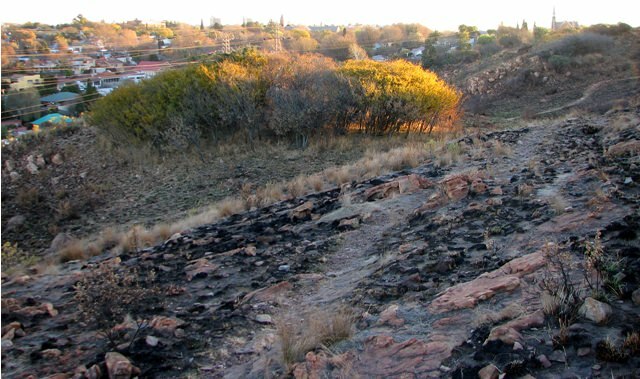 The Koppies look especially alien in winter, when it hasn’t rained for months and controlled burns have blackened the ground. The Koppies (“koppie” means “hill” in Afrikaans) are divided into three sections — east, central, and west. The east and west sections are open to the public; Joe and I walk on Koppies East about once a week. But the central section is open only for guided tours a few times a month. These tours usually start at an ungodly early hour, which is why Joe and I had never made it to one. But last Sunday morning we dragged ourselves out of bed at sunrise and went to Mark’s Park, across the road from the Koppies Central gate, for a three-hour guided hike of Koppies Central and East. It was a beautiful morning and 30 or 40 people showed up for the hike. We met Wendy Carstens, the Chairman and head of conservation for the Melville Koppies Committee, who corralled everyone and led the way through the gate. 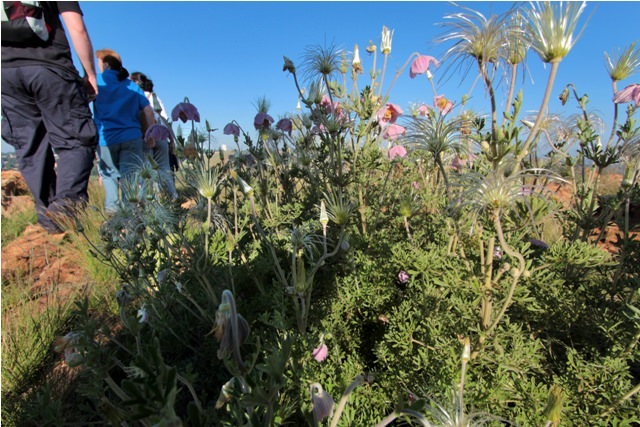 The line of hikers tramps past a cluster of wildflowers. The thing that amazes me most about the Koppies at this time of year is the grass. I had no idea that grass grows in so many shapes, sizes, and colors — green, brown, yellow, pink, white, and countless shades in between. Six months ago during the dry season, the Koppies were brown with hardly any grass. But it’s late summer now and the grass is above my head in many places. Brown and green grass with Joe in the background. Note the distinctive bush hat. We entered a thicket and heard a racket of gray loeries calling from the branches above. Then we caught a glimpse of a large bird flying off — a spotted eagle owl! The loeries had been trying to scare him away from their nests and the hikers came along just in time. I wasn’t able to catch a photo. This was a fast-paced hike, more for exercise than for learning about flora and fauna. I had to prod Joe periodically so he didn’t hold up the line — he prefers to amble along and examine all the flowers and mosses and birds. We’ll have to go back for one of the slower-paced tours. We trek down a hill on Koppies East. Downtown Joburg is on the horizon. Winded from climbing, we stopped for breakfast on a rocky outcropping in Koppies East. 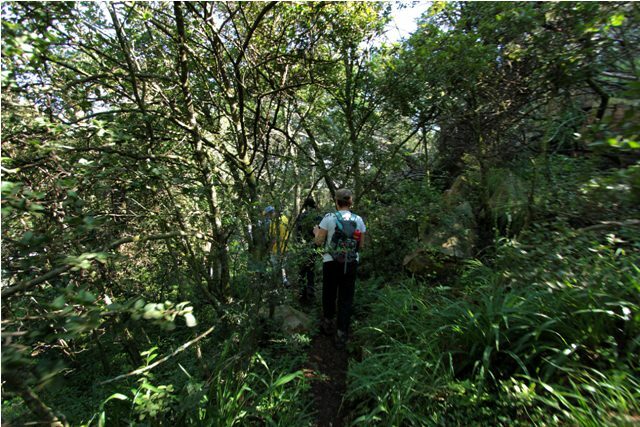 Then we continued back into the central section, walking through a grove of protea trees and into a forested area along a stream. I found my way to the front of the line and talked with Wendy about the challenges of keeping the Koppies in their natural state. The reserve covers 160 hectares and Wendy works with just a small handful of workers and volunteers. Keeping the koppies free of invasive, non-indigenous plants requires hours of back-breaking work; Wendy constantly pulled weeds as we walked. Another interesting thing about the Koppies is that one minute you’re on a grassy savanna and the next minute you’re in a dense forest. It’s also very difficult to contain crime and pollution in the Koppies. Although they are right in the middle of town, the Koppies are vast and isolated, making them a haven for criminals and the homeless. Koppies Central was closed to the public several years ago due to a proliferation of muggings and vandalism. Koppies East once contained a squatter camp. Koppies West is only safe to visit with a group. But Wendy and her staff are determined. Because of their hard work, people like Joe and I can walk out of our houses and, in less than ten minutes, transport ourselves to another world. 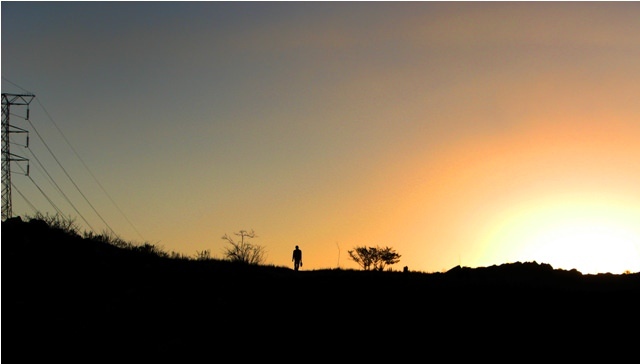 A man commutes home through Koppies East on a winter evening. I still haven’t visited Koppies West, which is double the size of Koppies Central and ten times bigger than Koppies East. There is a guided hike there on Saturday morning. If it’s not raining and I manage to get myself out of bed in time, there might be a Part 2. Interesting how many variety of grasses can be fount sometimes in the same area. Once I counted over forty different in less than half a square mile near the Saskatchewan/northeastern Montana Border. I would imagine than a more temperate climate like South Africa would have even more. Beautiful pictures as always, thank you. Thanks for the lovely blog, Heather.The photos are beautiful. I ‘m amazed at what you manage to take on the hike! 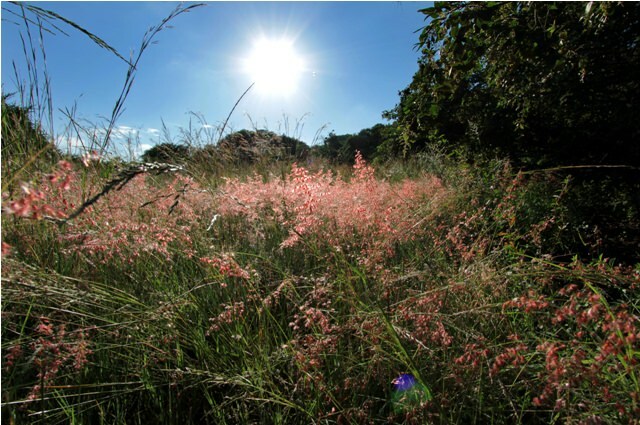 The walk on Melville Koppies West on Saturday 5th Feb will also be beautiful. We have been working on the trail this week to make it pristine. The start is at 8am so you can have a little sleep-in. Thanks Wendy! I’m planning to be there. So nice to see MK through the eyes of others. Such a pity that so few take the opportunity available to them to enjoy the ever changing experience so thoughtfully prepared for them by Wendy Carstens, Chairman of MKMC, her committee and co-workers. 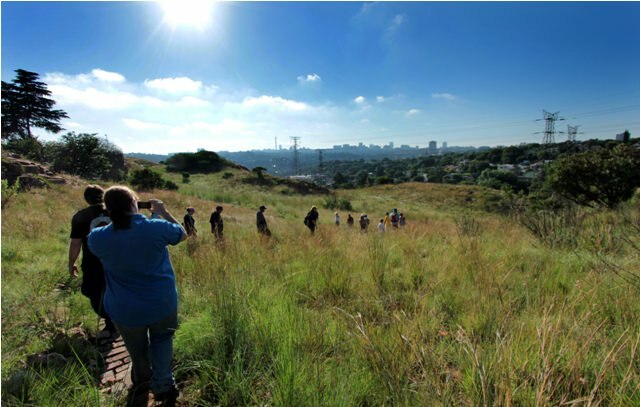 Such a pity too that the authorities fail to appreciate the work of volunteers who make this mini Cradle-of- Humankind available, especially to the immediate public of Johannesburg, through their interpretation of the history ( recent and archaic), culture and biodiversity of this small witness area of the original Witwatersrand Ridge. Thank you Heather. It’s so interesting to see little bits of nature within a big city. Kind of surreal being in a nature reserve and seeing Joburg’s skyline in the distance.